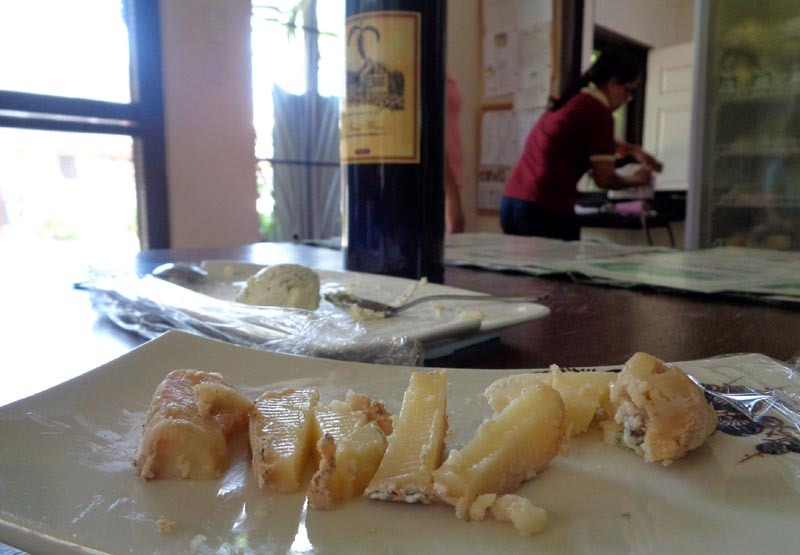 Anyone can do a food tour...just read up on food on a destination, connect the dots and do the leg work. As a DIY budget backpacker, that's how I do it. I could get lost, maybe get scammed, maybe the place closed down, or just couldn't find the place. There are no guarantees. 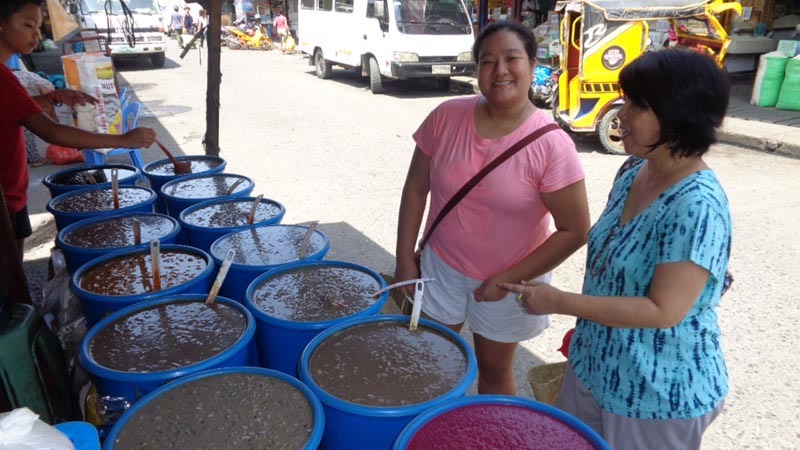 However, I got the chance to actually participate in an organized food tour of Davao by Mel Pangan. Big difference! kinilaw, grilled tuna tail, deep fried pork rinds (crunchy chicharon) and Filipino Ratatouie (pinakbet) for a sumptuous lunch! 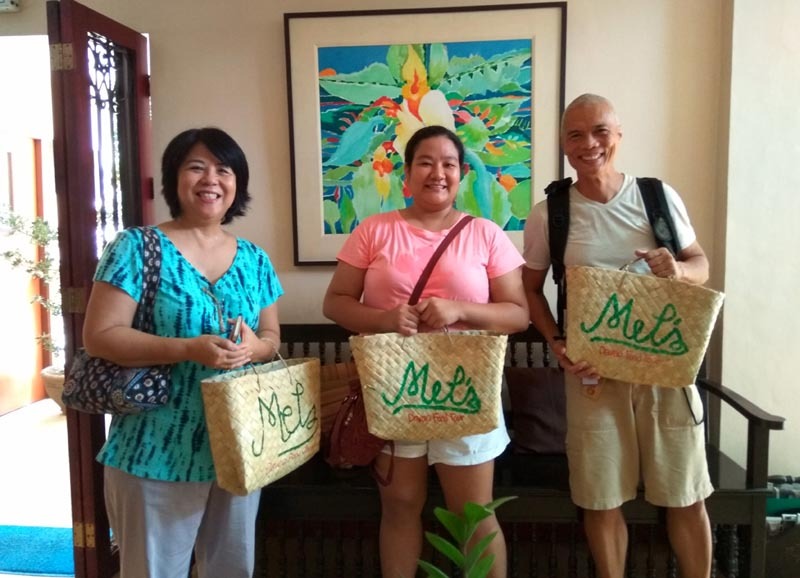 Mel is a local who knows Davao like the back of her hand and can articulate on the why, hows and who of Davao's rich history and current on-goings. 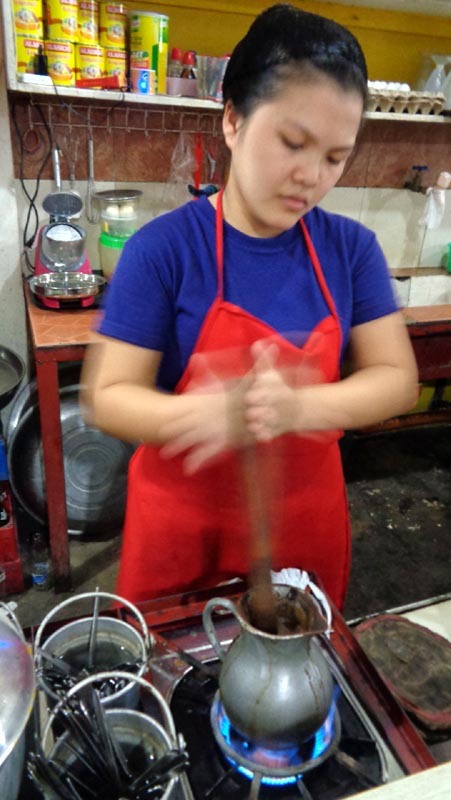 More importantly, she has a knack for planning and logistics which immeasurably help in her food tours. Her family comes from a long line of prominent Dabawenyos including her mother, Dr. Rizalina M. Pangan who is a 2006 Datu Bago awardee. 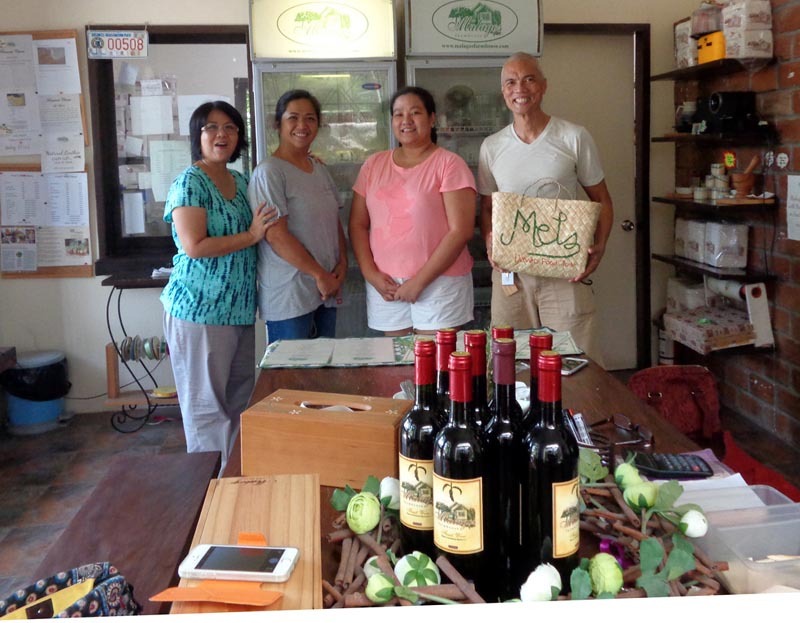 They run a quaint family hotel, Bahay ni Tuding, that is centrally located in the heart of Davao. The tour meeting place is at the hotel - best to check-in here if you're visiting Davao. 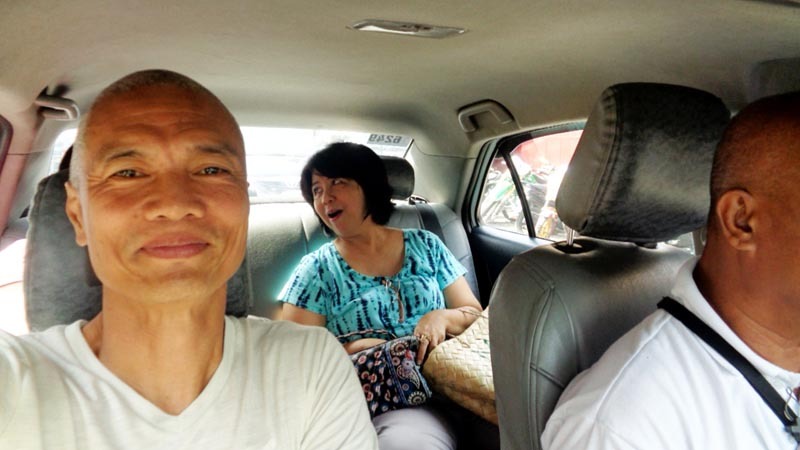 There was another one in the group - Noelle, a doctor visiting Davao for the first time. It would be the three of us from 8am to to 3pm - Mel, Noelle and myself. The tour itself was good bonding for all of us. At the end of it, we were not only full, but blessed to meet such kindred souls. First we went to Bankerohan by cab to try the kinutil and puto-maya. 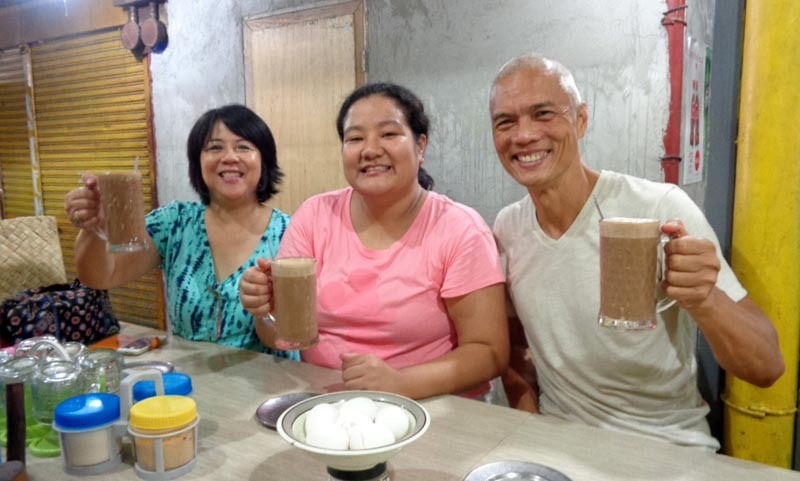 Kinutil is a local hard-to-place morning health drink - a blend of hand-whisked chocolate drink, egg, fermented coconut juice (tuba) and milk. Can you imagine the taste of it? You can't! You simply have to experience it. Puto maya is a popular sticky rice offering either in purple, brown or white. There are many stalls offering the breakfast combo, but Mel seems to have selected the best and cleanest stall of the lot. 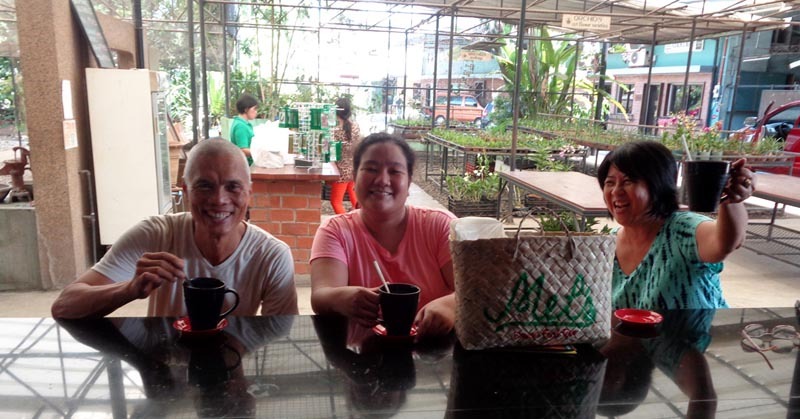 Not necessarily a food destination, but an essential stop to any tourist who wants a deeper understanding of Davao. The place gives a historical backdrop of the city using artifacts, preserved pictures, old maps, etc. This is where Mel stood out. 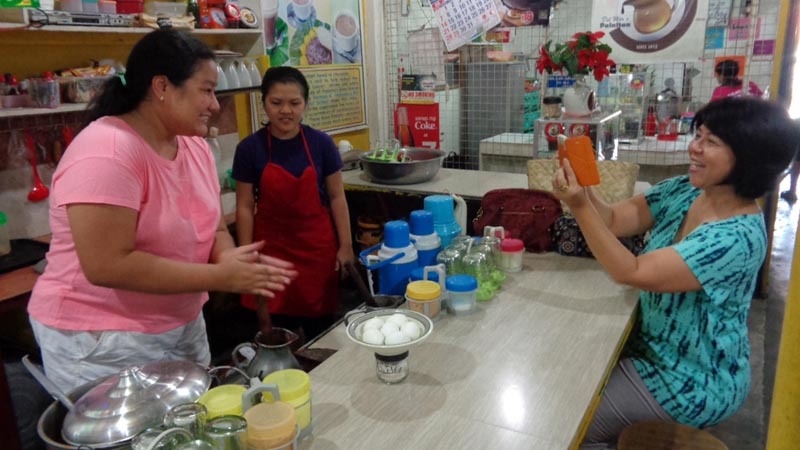 She explained many things why Davao came to be, adding more to what the museum tour guide was saying. 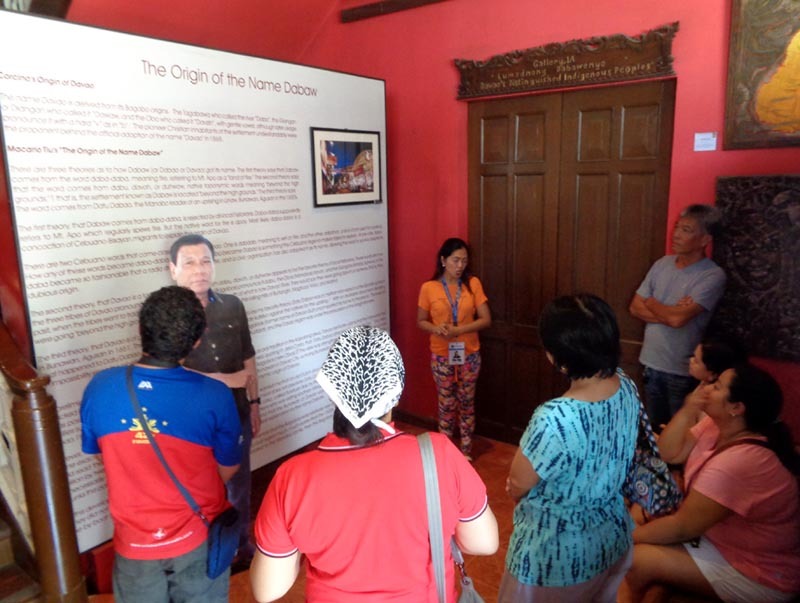 The museum tour guide said Davao became a city in October 16, 1936. So what? Met added dimension to that event by explaining why it became imperative for Davao to become a chartered city - a clever political maneuvering to keep the power of the dominant Japanese in check. 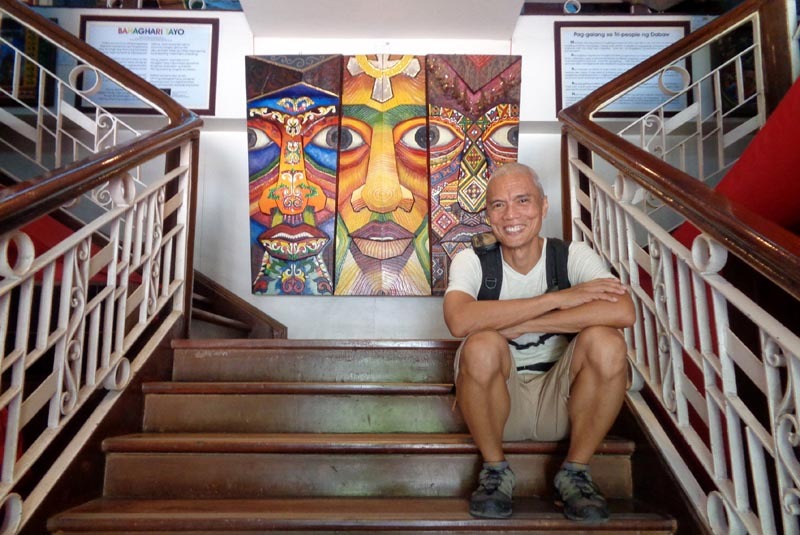 The Japanese that time, before the WWII, enjoyed an overwhelming dominance of Davao. In fact, Davao was called Little Tokyo. 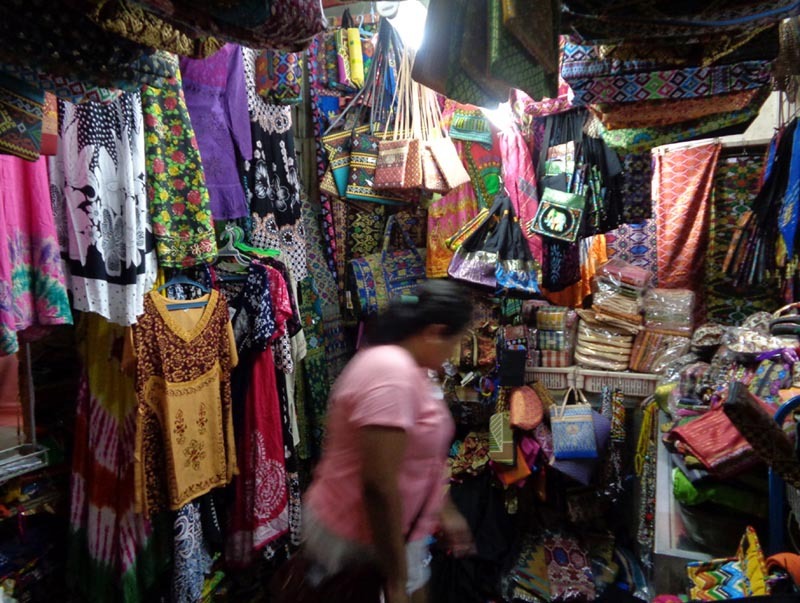 Most of the products of the Lumads (indigenous local tribes) can be found here from wood carvings, sarongs, t-shirts, malongs, etc. It's also the place for souvenirs and Davao memorabilia. We didn't stay long but it was a good stop to check things out. 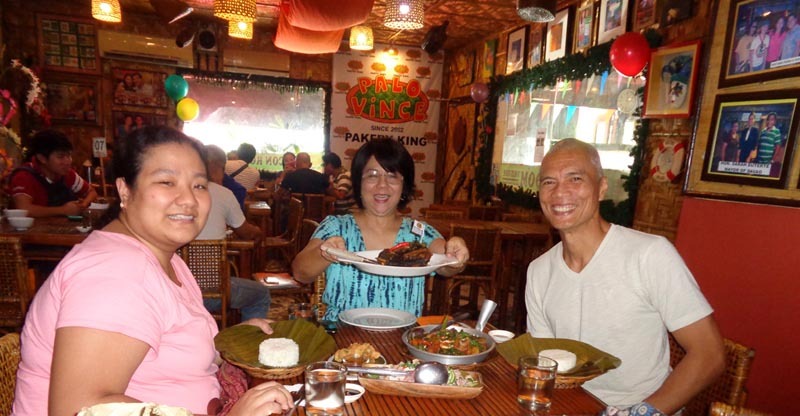 Davao prides itself in serving the best tuna dishes from kinilaw to panga ng bariles, to tuna tail. Yes, they are all good. But where do you go to savor the best? Again, Mel seems to have nailed that one down. We went to this unpretentious but decent restaurant serving Davao's staple - kinilaw, grilled tuna tail, deep fried pork rinds (crunchy chicharon) and Filipino Ratatouie (pinakbet). It was one of the best meals I've had in Davao. I couldn't pick on a better dish...they were all good and cooked fresh! 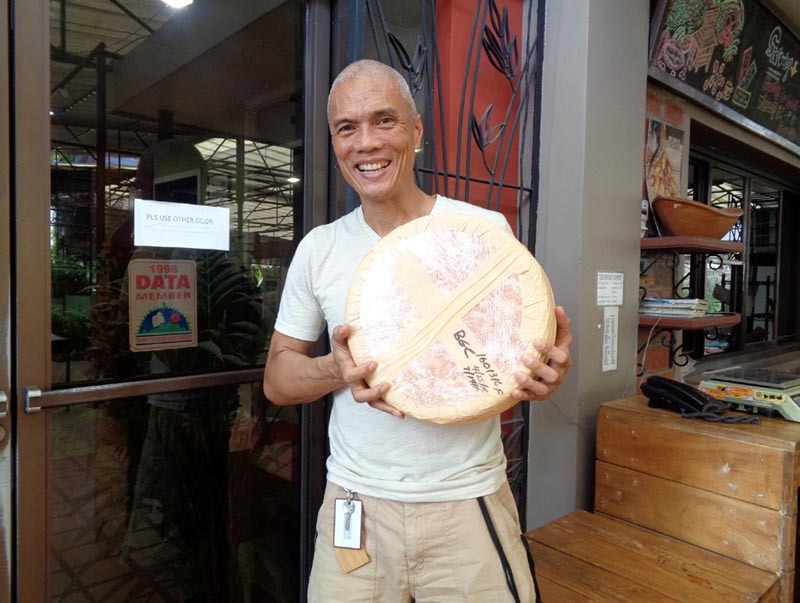 Prominent on Davao's tourism map is Malagos Farmhouse - they make their own artisan European cheese and they produce their own chocolate which have won in international competitions. 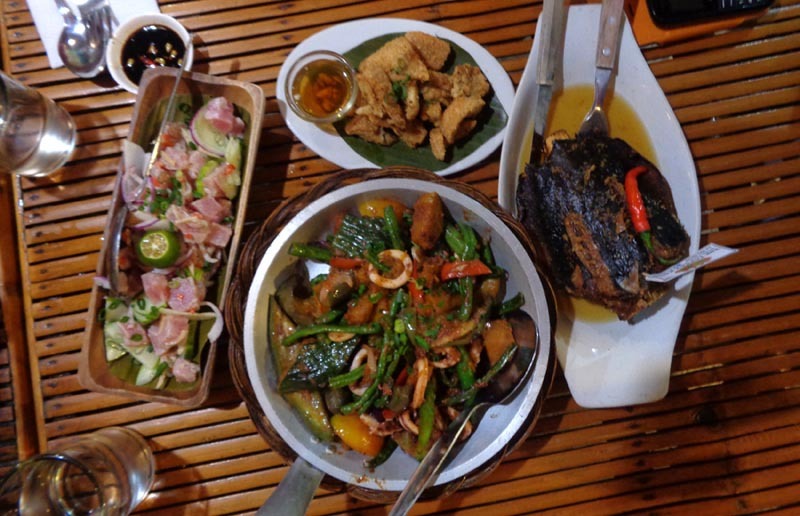 Everything about Malagos is a culinary level-up from the usual local offerings. We helped ourselves to cheese on crackers and washed it down with their very own iced chocolate drink. 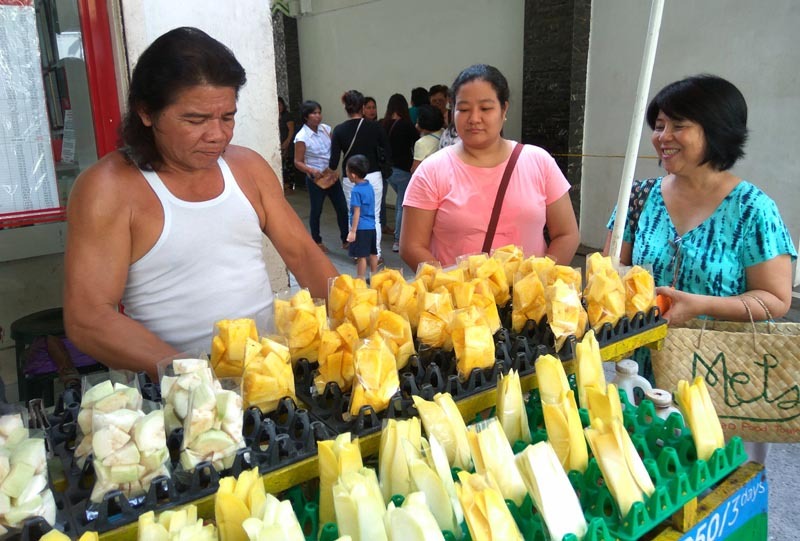 Magsaysay Park is the default place for durian. They get the first pick from the freshest harvest. 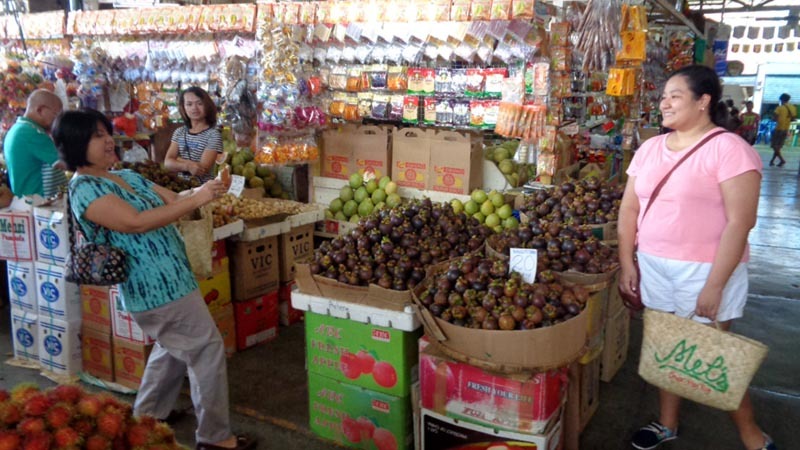 Yes, you pay a premium but you have the assurance you get the best durian in the city. The thing about durian is that you either hate it or love it. It was Noelle's first ever. Tasting the D101 variety, which is probably the most benign, she still couldn't take it in. After 2 seeds, she threw-in the white towel. Good for me! I devoured the rest. 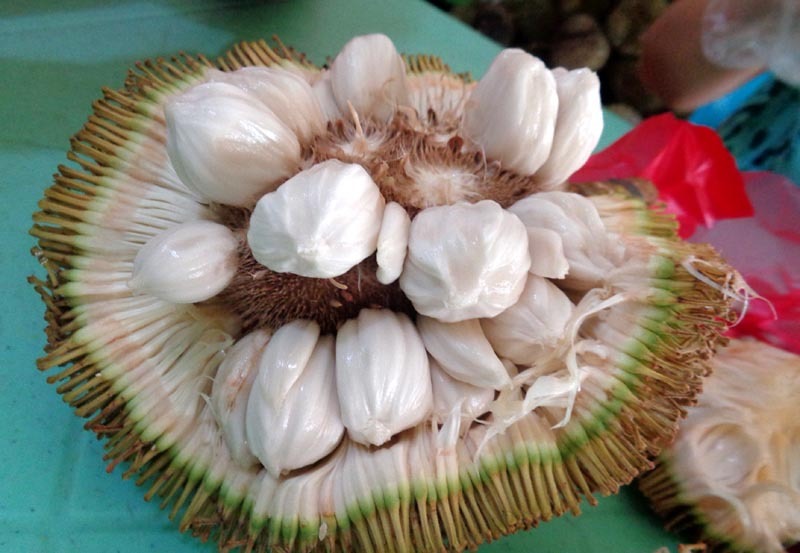 The marang we had was perfectly in its peak - juicy ripe and sweet without the tarty after taste. 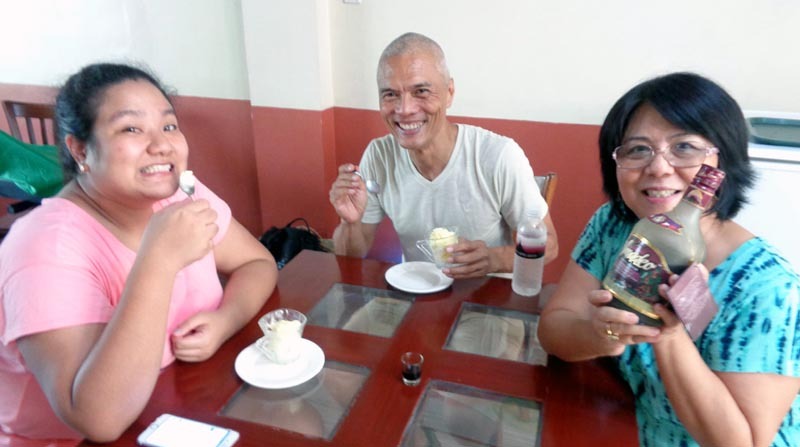 We went back to Bahay ni Tuding for our last indulgence - durian ice cream poured with local liqueur. Voila! It tasted like a frozen cocktail drink - very refreshing in this humid and hot climate. I can only burp in satisfaction while writing this. This is one heavy dose of gastromic indulgence. I felt like a king feasting on food fit for a king. Thank you Mel! This is one highlight for me! ps - If you want me to objectively cover your food tour or food event for this website (openings, food tasting, menu launch, etc. ), email me. 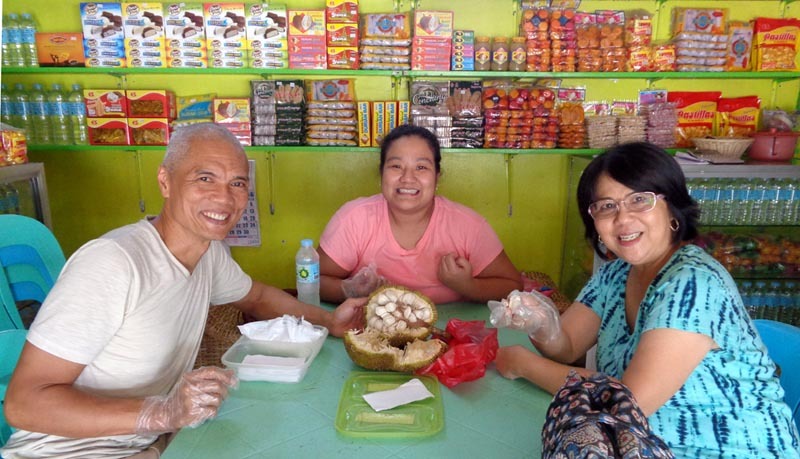 »» next Food Odyssey story: Celebrating Davao's King of Fruits - Durian!